Wireless audio is incredibly convenient, but the DALI KUBIK FREE’s talents don’t stop there. Whether you’re after the best possible sound quality or simply want to hook up some older equipment, you’ll find that we’ve equipped the system with the most comprehensive selection of cable inputs. Easy connectivity through a wide variaty of sources - e.g. Bluetooth, USB (Micro), Optical (Toslink) and RCA (Chinc). 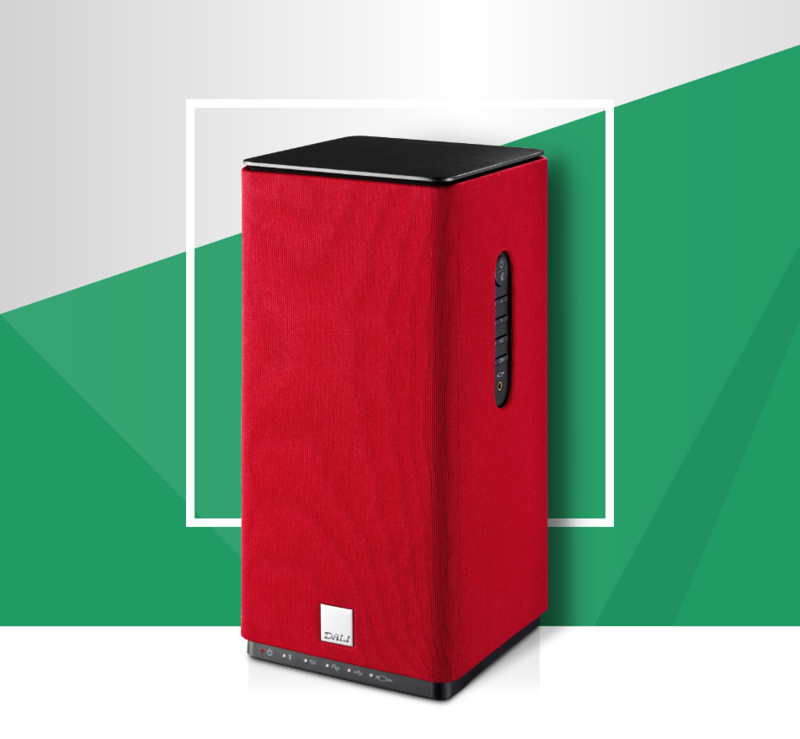 Both the KUBIK FREE and KUBIK ONE features a state-of-the-art digital amplification! The built-in four channel 100 Watts digital amplifier works perfectly with the famous soft dome tweeter and the iconic wood fibre cone. The KUBIK series provides a true stereo solution with a genuine sound stage through traditional speaker technology. By working with many of DALI’s well-known loudspeaker technologies like the soft dome tweeter, wood fibre cones, low-loss rubber surrounds and a glass reinforced polymer basket, the KUBIK system is clearly a true DALI loudspeaker at its core. Adding a 4 channel stereo Class D amplifier into the mix only underlines the development team’s dedication to making the KUBIK system a real Hi-Fi speaker. The standard "out of the box" grille colours for the KUBIK FREE and KUBIK XTRA are the classic "DALI red", black, or white. On top of that you have 6 optional stylish colours for the interchangeable covers. If your KUBIK FREE came with the outdated remote (in plastic), you are entitled to a replacement with the new updated aluminium remote. You just have to fill out the form with you details, and we will send you the new remote free of charge. The essence of the DALI KUBIK FREE is connectivity. This elegantly designed active speaker enables you to enjoy music from a wide variety of sources. The broad range of connectors ensure that any device will connect to the KUBIK system at the best possible quality. Bluetooth is a wireless standard with almost 20 years of use in mobile and portable devices. By adding Bluetooth ver. 3.0 to the KUBIK FREE system DALI stays true to the goal of making an active speaker for everybody, and by offering the Apt-X protocol on top, even the most demanding of listeners get the best possible transfer of audio. When connecting an external speaker to a flat screen TV, using an optical connection (TOSLink) is the best audio solution. 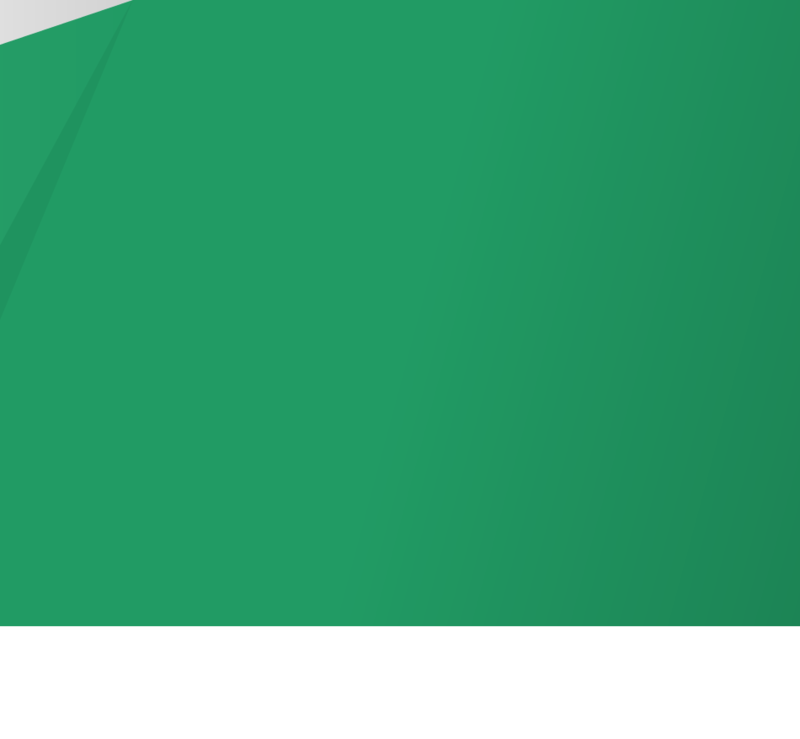 The KUBIK FREE system has a built-in, easy to use IR learning system, that can be paired with almost any remote control to navigate every function. Control the volume, mute, power and source select in three easy steps. If using the KUBIK FREE system in larger room or in a TV environment extra bass can improve the audio experience greatly. 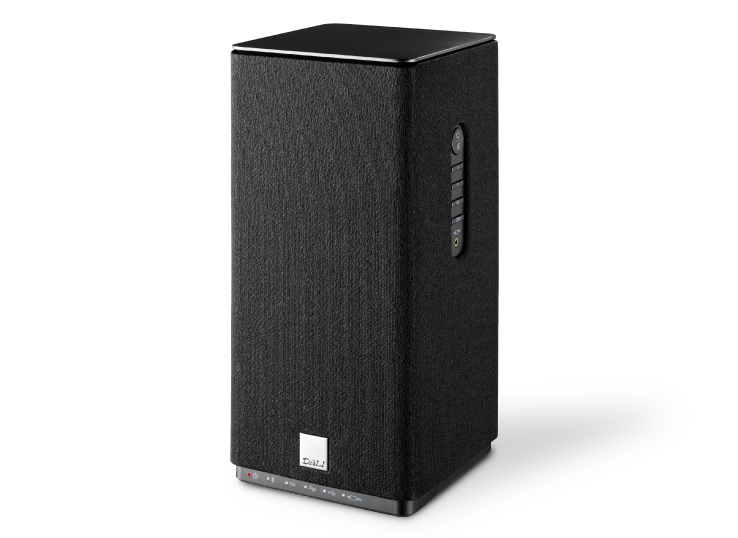 The KUBIK FREE lets you connect any active subwoofer directly. Connecting a subwoofer is automatically detected and the audio settings of the KUBIK FREE changes so the amplifier automatically sets the crossover point so anything below 80Hz is diverted to the Sub. The KUBIK FREE system offers two means of analogue input. A RCA (AUX) connector (placed underneath the unit), and a 3.5mm stereo mini-jack connector (placed on the side). The mini-jack input can be used to quickly connect a mobile audio source, such as an iPod or any other MP3 player, to the KUBIK FREE system. If playing audio from a PC or Mac, using the KUBIK FREE system as an external speaker is possible via the USB audio connector. Offering an easy and driver free interface to the PC or Mac it is the perfect choice for your desktop audio system. Picking the right amplifier for the KUBIK FREE system was no simple process. With many excellent choices available it came down to pure listening, a lot of listening. After picking the best possible solution, our R&D team set out to refine the amplifier, the power supply and the layout of the circuit board, to perfectly match the needs of the KUBIK FREE system. The 100 Watt Class D amplifier is a true active solution, offering a fully digital crossover, direct handling of digital sources and a high quality AD converter. The four channel stereo amplifier (4 x 25 Watts) controls the audio signal to the woofer and the tweeter module individually. This is a major reason behind the high quality performance of the KUBIK FREE system since it makes it possible to control and optimize the audio stream perfectly for the drivers used in the KUBIK FREE system. Having that level of control lets the acoustic engineers transform every bit of information into accurate motion in the drivers. A 'Switch Mode Power Supply' (SMPS) offers consistent output, a compact size, a low heat emission, and a maximum power output of 120 Watts. By integrating the SMPS into the KUBIK FREE the power supply can be tightly optimised for the amplifier and the signal path between power supply and amplifier is shortened to almost zero elimination reactance. The integration also eliminates the need for a clumsy external power. At the same time the SMPS is less dependent on a steady mains supply compared to a traditional power supply, letting the KUBIK FREE system continue to work at maximum efficiency even in areas with fluctuating mains supply. This type of magnet enables the KUBIK FREE system to handle more power and helps disperse the heat generated around the fast moving voice coil quicker, thereby reducing power compression. This in turn allows the tweeter to reproduce high frequencies with higher accuracy, giving the KUBIK FREE system an impressively detailed sound. Besides strengthening the entire product, the aluminium also gives the cabinet a solid feel. The top of the KUBIK is crafted from the same aluminium and reveals the solid build of the KUBIK FREE. The back plate acts as heat transfer for the amplifier and power supply. Using aluminium makes it possible to not only create a compact cabinet that will be easy to place in any room, but also giving the KUBIK FREE a simple yet iconic look. "The KUBIK FREE and KUBIK XTRA is genuine DALI hi-fi sound, authentic and full of atmosphere." 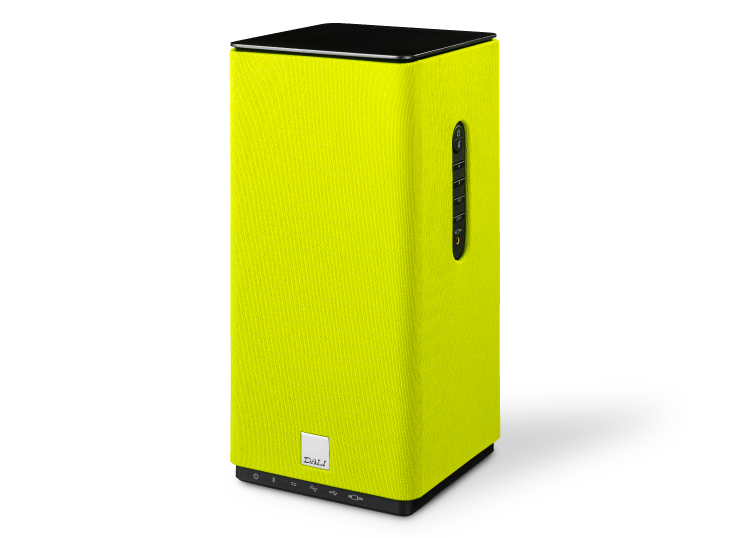 "As for the sound performance, the KUBIK’s deliver a full and rich sound, which will bring loads of joy no matter if setting them up with a TV or using them alone." "The clarity is unique and this is a true statement to the engineers at DALI because of the amplifier specifically build to the KUBIK FREE." "With the KUBIK FREE, you get an easy to use and efficient speaker that will surprise you with its outstanding ability to deliver true hi-fi sound." "As for the sound quality, the KUBIK FREE truly impresses with its powerful and incredibly clear sound, and especially the midrange strikes the listener with a great sound – even when standing alone." "KUBIK FREE delivers the best sound performance and has – as the only one – made it very easy to use Bluetooth." "The great sounding KUBIK FREE is elegant and flexible, and is a enjoyable musical partner. "